Phrases a newscast anchor stereotypically says, willfully misinterpreted for punny goodness, outfitted with appropriate set-ups. 23a. [“What’s in your attic? And do penthouses have better resale value? Find out in today’s ___”] TOP STORIES. 29a. [“Museum officials report a priceless vase has shattered. Stay tuned for the ___”] BREAKING NEWS. 43a. [“A courtroom artist has been arrested for fraud. ___”] DETAILS ARE SKETCHY. 66a. [“Schools are cracking down on their most tardy students. We’ll have ___”] THE LATEST. 68a. [“Coming up, a pistol dueler tells us his stance. Now ___”] BACK TO YOU. 93a. [“After the break, people are leaving the city during winter because of crime. Plus ___”] TRAFFIC AND WEATHER. Is it just me, or does this one seem much weaker than the others? Am I missing something? 111a. [“Our camera crew entered a one-hour photo shop at ten. __”] FILM AT ELEVEN. Clever and amusing, but rather obsolescent. 118a. [“With more about those defending the accused, our reporting is ___.”] STANDING BY. This one also feels subpar. Definitely a cute theme. Mostly effectively realized, and sufficiently diverting. Prediction: a significant faction of solvers will not understand 62a [Fighting a liar, e.g.] SPOONERISM (i.e., “lighting a fire”) and will complain. Not here, you understand. 17d [About which it was asked “Why are you blue?,” in a classic song] BROWN EYES. This is the 1925 composition by Alfred Bryan and George W Meyer. I didn’t know it. 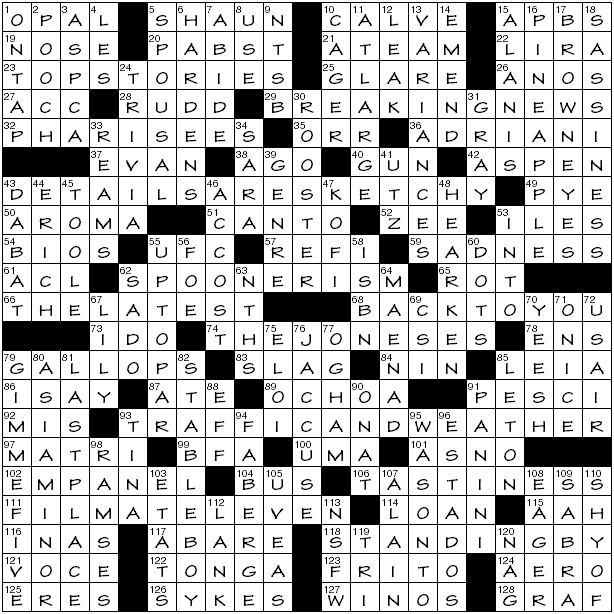 The previous entry is part of a triple nine-stack in the upper right, along with 16d [Pizza topping] PINEAPPLE* and the of-course-it’s-in-the-last-row/column 18d SASSINESS. Complementing these, the southwest proffers 79d [“Up top!”] GIMME FIVE, 80a [Anatolia, familiarly] ASIA MINOR, 81d [Spot for the booby prize] LAST PLACE. 77d [Old Irish character] OGHAM. This is a medieval alphabet; is the clue precise enough? 5a [“__ of the Dead” (2004 horror movie parody] SHAUN. First of the so-called “Cornetto Trilogy”. This one’s bloody strawberry. 54a [Obits, basically] BIOS. That’s true, it simply has an added t.
94d [Egg-spensive jeweler?] FABERGÉ. GROOAAAANNN… That makes 127a [Grape nuts?] WINOS look good! Really good. 45d [Novelist John Kennedy __ ] TOOLE. Known principally for his posthumously published A Confederacy of Dunces, which in my experience is a polarizing book. I’m firmly in the “nay” camp. 123a [Corn chjip] FRITO. Was not expecting a brand name here. Doesn’t seem to be a generic trademark. 126a [A comedian called Wanda] SYKES. What’s up with the weird clue phrasing? Oh, here’s another incisive and trenchant thing I do. 96d [ __ Unidos] ESTADOS, 103d [ __-Unis] ÉTATS; 78a [Tennis doubles?] ENS, 88d [Start to fail?] EFF; 84a [Anaïs of “Henry & June”] NIN, 100a [Thurman of “Henry & June”] UMA (she played June, not Anaïs); and surewhynotheresonemore 18d SASSINESS crossing 59a [Blue state] SADNESS, and some distance directly beneath that 106a [Savor] (as a noun) TASTINESS. 70d [“Oh jeez!”] YEESH. Jeez and YEESH are but two of the many phonetically similar euphemisms for Jesus. These are fairly close-sounding to each other. 91d [Grilled sandwich] PANINI. I’m one of those (annoying?) people who uses panino if it is indeed just one sandwich. Oh, and I liked the symmetrical pair of 9d NTSB (National Transportation safety Board) and 113d NSFW (not safe for work). Fun times. And that’s the way it is, August 6th, 2016. I really liked this puzzle. And I figured out the meta! I found the trick myself and unscrambled the anagram. pannonica helped me find all the appropriate entries, which speeded up the process, and I’m grateful – but I DID IT!!! More on that later. On to the puzzle, which is a dandy. I bounced around the grid for a while until I landed in the SW corner, where 42d [Criminal justice concern] was REPEAT OFFENDERS. 79a [distant] should have been ALOOF and I had the A and the L but there wasn’t room for…wait! If I “repeat” the O from OFFENDERS. I can make ALOOF. Ah-hah! 22a [Event for a quartet] = DOUBLE DATE. DATE is DOUBLED. 14d [Game with contracts] = DUPLICATE BRIDGE. BRIDGE is DUPLICATED. 68A [Dramatic, cinematic, intergalactic conflict] = CLONE WARS. This one is my favorite. We have to CLONE the letters in WAR. 42d [Criminal justice concern] = REPEAT OFFENDERS. I figured it was worth repeating. 120a [People person?] = COPY EDITOR. This is the only clue that isn’t completely straightforward. COPY the letters in EDITOR and you’re all set. A solid, consistent, enjoyable theme, and a very fun solve. 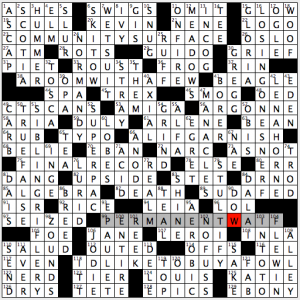 And that brings us to the meta: “In this challenging puzzle, the first letters of 10 entries can be rearranged to form an apt alternate title.” Any ten entries? This is a 21×21. There are a lot of entries. There must be some way to choose them….oh, hey, some of the clues are duplicated. Hmm. [Rogue, Storm and others] = XMEN and AUTOS. I remembered this one because it was so clever, and that sent me looking for the others. [Stuff in a garden] = MULCH and HERBS. [Boat propeller] = CREW and OAR. [Get rid of] = TOSS and ERASE. [Political entity] = BLOC and STATE. Put the first letters of those answers all together, shake them up, and you get MATCHBOXES. Or maybe MATCH BOXES. Either way. Ta-da! I loved 1d [“You are so wrong.”] GOD NO. I have to insert the comma in my mind. 4d [Salem resident] is not a witch or a ghoul or my friend Kim, all of whom reside in Massachusetts. There’s also a Salem on the Left Coast, and the answer is OREGONIAN. 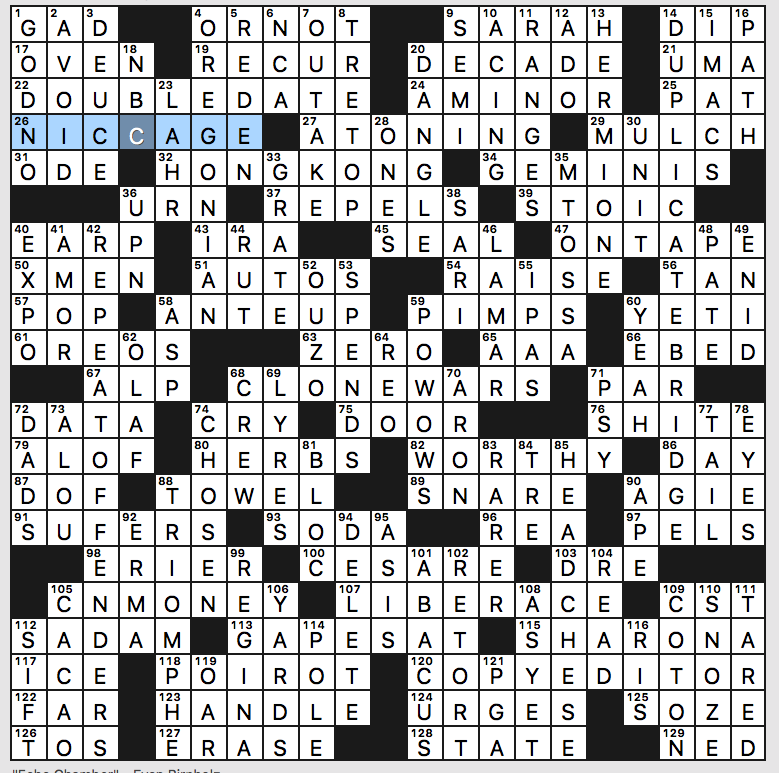 10d [Nailing] = ACING which is appropriate because I was watching Olympic tennis before I did this puzzle. 101d [Item once popular in counter cultures?] stumped me for a while. It’s ABACUS. What I didn’t know before I did this puzzle: that Keyser SOZE was a name [“The Usual Suspects” villain] at 125d. 23a, COMMUNITY SURFACE [Municipal tennis court?]. Community service. 38a, A ROOM WITH A FEW [Crowded dorm symptom?]. A Room with a View. This clue feels a little off to me. 66a, ALIF GARNISH [Embellishment on Arabic calligraphy?]. Olive garnish, which isn’t really a phrase. This one’s screaming out to be ALIF GARDEN. 75a, FINAL RECORD [Last log entry?]. Vinyl record. This one didn’t result in hilarity so much as it did a quasi-legitimate phrase. 99a, PERMANENT WAIF [Animal always without a home?]. Permanent wave. 118a, I’D LIKE TO BUY A FOWL [Request at the poultry farm?]. “I’d like to buy a vowel.” For how many of you do “fowl” and “vowel” have the same number of syllables? 16d, LOSING ONE’S NERF [Cause of playtime sadness?]. Losing one’s nerve. 51d, SIBLING RIFLERY [Brother-and-sister biathlon training regimen?]. Sibling rivalry. This was pretty much the only theme answer I liked. Everything about this puzzle was just fine. Typical Sunday LAT theme, and though I didn’t care for a lot of the theme clues/entries, the fill was decent aside from a few partials. No idea why OPA got the obscure/outdated clue [WWII cost-stabilizing agcy.] rather than, you know, “Opa!“. Also, I’d guess more people are familiar with the use of SCOTIA as an ancient name for Scotland rather than Ireland, but I guess you can’t very well put Scotland in a clue for SCOTIA. Can we all agree to never call ATMs “ATMs” ever again, but instead just use ways they’ve been clued in crosswords? For example: “Oh man, this is a cash-only bar? I gotta find a [Jackson ejector] pronto!” Or “Hey, you think this 7-11 has a [Kale source]?” And so on, ad infinitum. Hello there, everyone! How is everything? Hope you’re having a good Sunday and continuing to bask in the warm weather and engage in the Olympic spirit. “Sports will make you smarter” moment of the day: YANKEES (62A: [Team once called the Highlanders]) – Yes, the New York YANKEES were once named the New York Highlanders, but did you know that the world famous franchise actually started in Baltimore and was named the Baltimore Orioles? The Bronx Bombers were indeed founded in Baltimore and were named in the Orioles (no relation to the current Baltimore Orioles) in 1901. Two years later, the team was purchased and subsequently moved to New York in 1903, where they were named the Highlanders. The team was renamed the Yankees in 1913. This is going to be a brief recap. It’s been a strenuous day, and it’s now late in the game. Plus, I’m responsible for the Monday NYT, which is about an hour away. 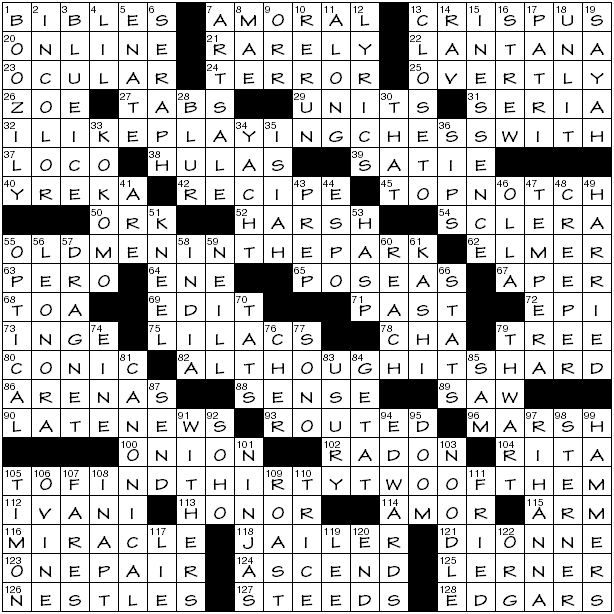 We get a [… line from comic Emo Philips] distributed across four long entries (32a, 55a, 82a, 105a): I LIKE TO PLAY CHESS WITH | OLD MEN IN THE PARK | ALTHOUGH IT’S HARD | TO FIND THIRTY-TWO OF THEM. Was in the act of filling in 113a [Revere] with HONOR when I saw the crossing 109d [Honor with barbs] and reflexively removed my answer, only to reinstate HONOR when it was inevitable. This is why some solvers don’t care for blatant duplications. 109-down is ROAST. 80a [Pylon-shaped] CONIC. Was thinking architecturally, so traffic cones didn’t inhabit my mind’s eye. Speaking of which, 23a [Visionary?] OCULAR, 54a [Eye doctor’s white coat] SCLERA, 55d Kind of mouse] OPTICAL. 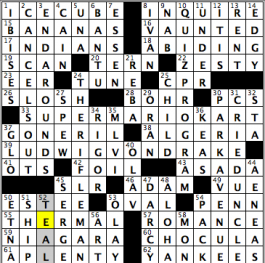 54-across—just mentioned—is one of a fair number of tricksy, question-mark-less clues in this crossword. Another, which I feel stretches a little too far, is 96a [Building site for cranes] MARSH; I guess we’re considering nestmaking, but that is a bit much. Adverbs with -ly! 1d [How a sot acts] BOOZILY, 21a [Not as a normal thing] RARELY, 25a [For all to see] OVERTLY. 6d [Six-winged figure] SERAPH. Damn, that’s a lot of wings. many no doubt have been rendered in 47d [Durable paint] TEMPERA. Favorite clue: 30d [One of those things] THAT. 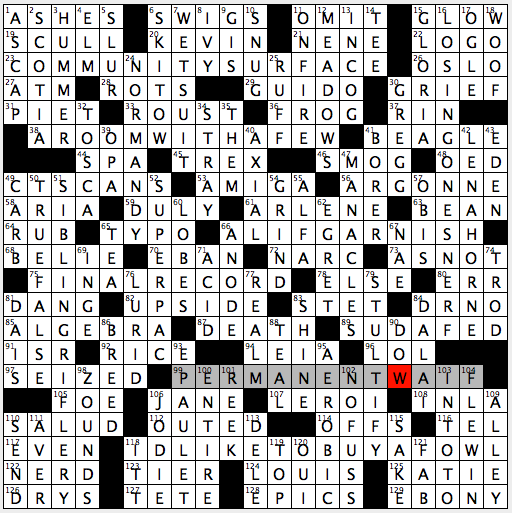 Not among the more thrilling crosswords I’ve worked lately, but there’s nothing intrinsically wrong with it. The cluing seemed more playful than usual, but I’m pooped. Have I mentioned that? It might be affecting my mood. This entry was posted in Daily Puzzles and tagged Bruce Venzke, Donna S. Levin, Doug Peterson, Emily Cox, Evan Birnholz, Henry Rathvon, Samuel A. Donaldson. Bookmark the permalink. Liked the NYT theme – generated a couple of chuckles from me. I was okay with TRAFFIC AND WEATHER. STANDING BY seemed a little weak. 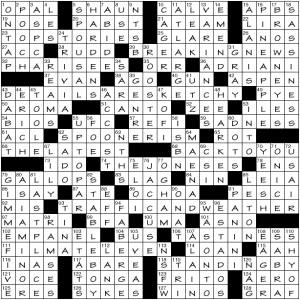 I thought the middle of the puzzle was tough – that area where J’ACCUSE, OGHAM, OCHOA and MAENAD came together. I got lucky and pulled Lorena OCHOA out of my … hat. NYT: I’m with Pannonica and Gary in that the theme was cool, but that section with OCHOA- MAENAD, etc… was pretty rough. NYT: Fun fact about early OGHAM: It had no p sound. That was added later to accommodate the name of a certain missionary the pope sent to convert the Irish. I’m meh on this one. I found the theme clues not all that funny, and I agree that the ones near the bottom were lamest. The fill had its share of names I didn’t know, and I’d have felt better if REAMS didn’t cross EVAN (which could, after all, have been Ivan for all I knew) and OCHOA didn’t cross OGHAM. At the very least, REAMS could have been clued as a word. There was also a lot of easy, routine fill. 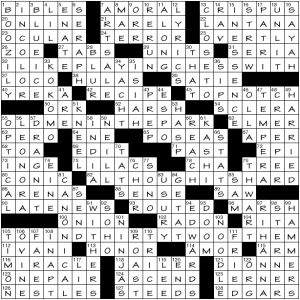 I agree that Evan’s Washington Post puzzle is clever and well done. Nonetheless, for me it was a disappointment. There were simply too many clues (mostly but not only pop culture) I could only get by googling. I much prefer the puzzles he usually creates, which depend more on clever/devious clueing. I love the ahah! moments when I realize what he has in mind. 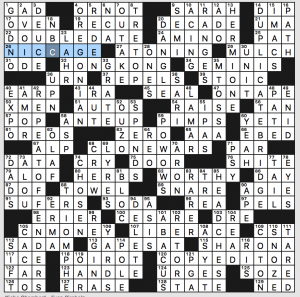 Also, in a puzzle that depends on doubled letters, I was surprised to see 26a: NICCAGE, with the two C’s in adjacent boxes, not doubled in one. As for the NYT, I enjoyed it a lot. All the theme answers worked well for me except 118a, STANDINGBY. I thought the NYT was boring. The theme was obvious once you filled in the NW, which was not hard, and then it was just a matter of guessing which cliched phrase would fit. Yawn. No pizazz. Now, Evan’s puzzle in the Post was brilliant — even before the meta. The theme was a head scratcher (for me, at least) but NCAA and OUTTAKE clued me, and, even then, I was confused for awhile, since it wasn’t clear if the rebuses would all function in the same direction. This was a Merl-grade puzzle. Thanks for a great Sunday morning, Evan! Edit: Yes, cyberdiva, NICCAGE was a tiny infelicity but I, for one, will forgive it, since that was plainly not a theme entry. And I noticed it but didn’t register it as an a problem. Doesn’t bother me at all. For STANDING BY, how about “With more about people trying to fly without reservations, our reporter is ___”? Are you printing out the puz file in Across Lite or Xword? The pdf from the Washington Post’s website? Either way, it may have something to do with your application’s settings. Thanks so much for your advice. Clicking on the printer icon on the Post website for the Sunday puzzle and choosing “Blank Puzzle” and Print produces the shrunken version I mentioned. Choosing “Download PDF” after clicking on the printer icon does produce a full-sized print. Thanks! Sorry for my slow Sunday brain. Now on to the puzzle! D.
GaryR, Mick: That must be it. The explanation, however, leaves me … Disappointed. More likely hall-of-fame running back Jim Brown (who played for the Cleveland Browns)? It was intended as a reference to the Cleveland Browns, like [Giant gains?] would be about the New York Giants. But I guess Jim Brown works there, too. An explanation from the puzzle constructor – Thanks! Just looked it up – Jim Brown did play for Cleveland Browns, but went to Syracuse rather than Brown. You two are both football experts compared to me. To tell the truth for a split second I thought the answer should have been “yard waste”.